UDA Technologies is pleased to accept an invitation to exhibit at the Scaling New Heights Conference where they will showcase industry-leading QuickBooks integration. 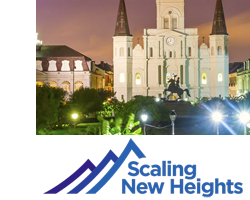 Hosted by Woodard Events, a strategic partner with Intuit, Scaling New Heights 2015 will be held in New Orleans, Louisiana from June 21st to June 24th. UDA Technologies is one of the fastest growing providers of construction productivity software in the United States, Canada, Australia, and 75 countries worldwide with double digit, industry leading revenue growth. Designed for growing businesses, UDA construction software manages over 65 billion dollars in construction jobs daily. Identified as a key partner in construction software technology, UDA Technologies is a Microsoft Partner and a Premier Intuit QuickBooks developer. UDA Technologies is one of the fastest growing providers of construction productivity software in the United States, Canada, Australia, and 75 countries worldwide with double digit, industry leading revenue growth. Designed for growing businesses, UDA construction software manages over 50 billion dollars of construction annually.